Dasan Ahanu is a southern storyteller who uses his poetry as a tool for conveying messages and for giving voice to the lived experiences of those who find themselves at the center and in the margins. 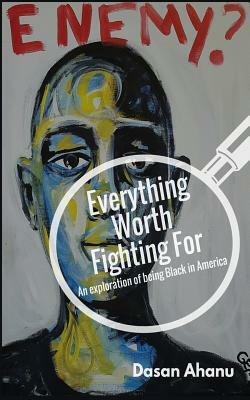 Everything Worth Fighting For: An exploration of being Black in America takes the reader on a journey of discovery into the many layers of Black life. From coming to understand the value in elder wisdom to struggling with the dangers facing Black youth, the book paints a picture of a multi- faceted existence. It is a resistance to narrowing perceptions and a call for society to never forget that there is so much more to any Black person than meets the eye. Ahanu writes in the introduction, "There is magic in our own experiences. Lessons learned and insight gained. It is our responsibility to share that with others. We have to tell what we know. We have to act like we know. It may mean standing alone. It may mean facing the unsettling of every bit of comfort we have established. We have to understand that sometimes interruption can be glorious freedom. Think about all that we have faced and still face in this country. We continue to push on fully aware that regardless of the achievements, the strides, and the resilience there are still those who will never see the amazing for what it is. Yet here we are. Here we will be. Still magic." Everything Worth Fighting For: An exploration of being Black in America also looks at the role of the artist as an activist and at the creation of art as a radical means of expression. Ahanu shares his experiences and offers his perspective on arts activism as a way to frame this new work. This book not only intendeds to engage, it is also intended to inspire, affirm, challenge, and push people's thinking. It is recognition of the beauty of being Black, of the struggles of being Black, and a scathing rebuttal to those who see Black life as anything less than amazing. Christopher Massenburg, better known as Dasan Ahanu, is a public speaker, organizer, workshop facilitator, poet, spoken word performer, educator, songwriter, writer, emcee, and loyal Hip Hop head born and raised in Raleigh, North Carolina. He has performed and hosted at events across the country. He is also the co-founder of Black Poetry Theatre, a poetry based theatre company that creates and presents original productions. Believing that "with great talent comes great responsibility," Dasan has also used his skill and resources to aid in developing the community and further social change. He has worked as an organizer on such issues as war, social injustice, workers rights, domestic violence and sexual assault; planned and facilitated community programs for Duke University's Center for Documentary Studies; conducted creative writing and performance workshops at middle schools, high schools, and colleges throughout North Carolina; and spent time working with at-risk/court-involved youth. Dasan has been a speaker or workshop facilitator at a number of notable conferences and symposiums. In addition to advocating for further support of poetry and spoken word programming, he has spoken on topics such as the impact of cultural arts programming, the arts and social justice, Hip Hop culture, Hip Hop pedagogy, and the arts as a tool for literacy. As a resident artist with the St, Joseph's Historic Foundation/Hayti Heritage Center in Durham, NC he has developed poetry and spoken word programming for youth and adults and worked to grow the Triangle's arts community. Dasan has created his own series of shows and collaborated with local promoters to provide some of the best arts and music events in NC. His work has been featured on National Public Radio (NPR) where he has been noted for his appearances on "News and Notes with Ed Gordon" and "State of Things with Frank Stacio." His writing has been featured in online and print publications. He has been showcased on NBC 17 in for his work with poetry slam. He is featured on the third season of Lexus Verses and Flow aired on TV One. He was featured in a documentary entitled, "Poet Son" that aired on WUNC-TV as a part of the North Carolina Visions film series. As a songwriter and recording artist, Dasan continues to record and release music with notable emcees, vocalists, and musicians from NC and along the east coast.